I was listening to a song recently, and it used the phrase "Child of God." It's one of those string of words you use and hear often, but I stopped this time when it played. Maybe it's because my own kiddos are growing too fast and I miss them being little. Maybe it was the way the song spoke to my heart that day. Or maybe it was just God painting a word picture for me, but those three little words reached down inside me. And I thought, you know what? I'm an adult. It's very rare that I look at my daily life with any child-like wonder any more. I've discovered most of the facts behind things that used to fascinate me. I've seen the ocean and the mountains. Watched sunsets and sunrises. Stopped to chase fireflies and played in the rain. All those firsts that bring joy and wonder to children, I've already experienced. Our spiritual lives can be much the same. When you've been a Christian for years, you run the danger of losing the wonder of God-moments. Your prayer life becomes routine. You can quote the Bible stories you've read multiple times. And every study feels like it says the same thing. But oh! 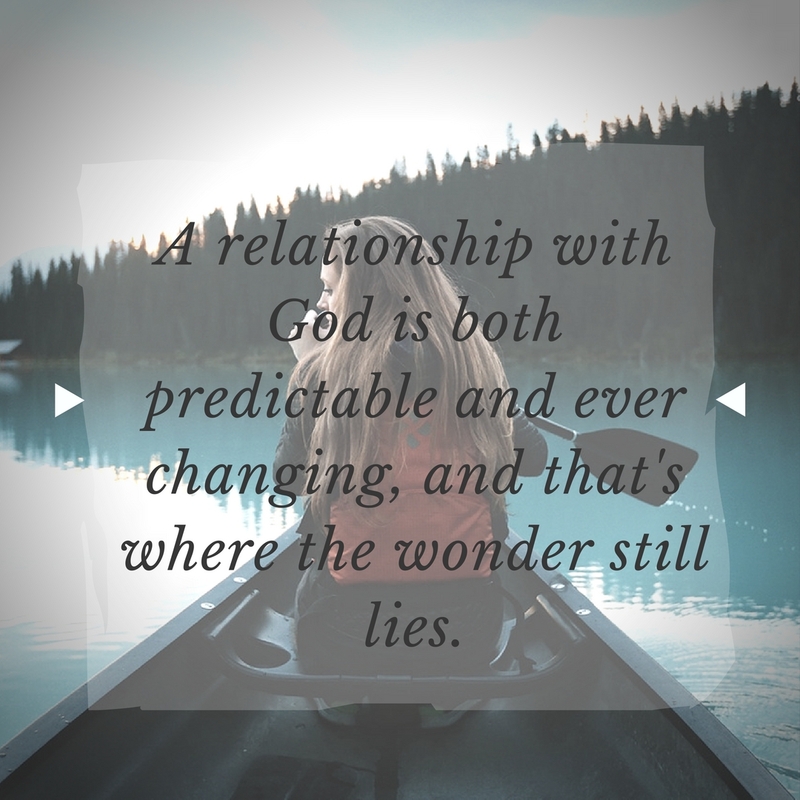 A relationship with God is both predictable and ever changing, and that's where the wonder still lies. We can know his character; he's faithful, our defender, trustworthy. We can know his love; it's bottomless, all-consuming, fierce. We can know his grace; it's redeeming, never-ending, freely given. But we can never know how he's going to move in our lives in each given situation. Who he'll drop in our path. What he'll call us to do. The miracles he'll perform. The way he'll breathe life into his Word as we hold it in our hands. Every single heartbeat God is both the same and new in our lives. He's our familiar adventure. May we never lose the childlike wonder of him in our lives. I love this post, Susan, because I've been feeling the same way lately. I'm reading a new Christian devotional, and it's been challenging me. I love that! I'd love to hear which one!